We had such a blessed Christmas this year and from what I've been reading on everyone's blogs, so have many of you. It's always so hard to take down all the decorations after the holidays and I did let it linger until the first week of the New Year. It's kind of like taking all the frosting off the cake. The house looks a little blank afterwards. Does anyone else feel this way? But, it's a clean slate and it's a new year! I've was very busy the first two weeks of January repainting an older scene, Christmas In Fox Creek Village, for a licensing project and for the simple fact that I wanted a better larger image. I don't usually enjoy repeating a painting, but my heart was really into it this time which was another blessing. I've decided to paint as many Christmas paintings as I can this year because they are just so much fun! I may even add more to this painting just to make it a little different. Maybe a horse and buggy on the road, more people, or whatever pops into my mind. I'm always open to suggestions. This painting will also be up for sale if anyone is interested. I'm not sure if you have noticed, but I've also added a tab at the top of my blog for Original Paintings where you can make direct purchases. I will be adding more paintings there as they are completed and still sell them in my Etsy shop along with all my prints. I also purchased a new Epson printer so I will soon offer larger format 11 x 14 and up to 13 x 19 inch in my Etsy shop. 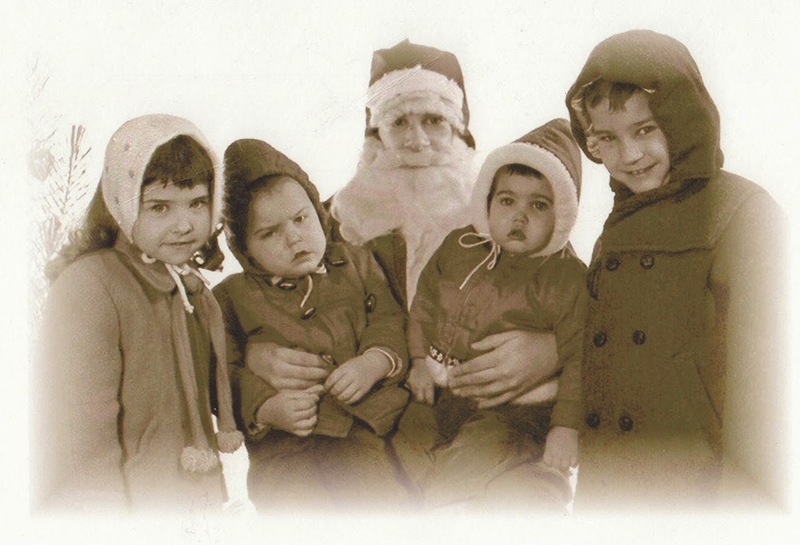 This year I had this photo of my siblings with Santa printed on a pillow to give to my sister and my mother. It's always fun to give something special to loved ones. That's me on the left. It looks like I trimmed my own bangs. The sad little guy next to me is Keith, a very youthful looking Santa, Patti, and Joe. I was so happy with this pillow because it is printed on a very nice quality slipcover that can be washed and the pillow was included. You can have your own memories printed on a pillow at pixels.com in a variety of sizes. That is a wonderful scene. I particularly like the covered bridge in the center. Your paintings are beautiful, Catherine. I enjoy my print every Christmas! thank you! Can I make a Reservation for the Fox Creek in? Absolutly charming, and so is the foto of you and your siblings. I love your winter Scenes. One of your prints is hanging in my kitchen and I love to look at it, no matter what season we have. Hi Catherine, I always enjoy seeing your paintings. They always look so perfect, just so fresh crisp and clean. I'd love to see a little dachshund romping through the snow, haha. Love your vintage photo, I'm sure your family treasures their pillows. Thanks for the dot com address. Happy New Year! Love the pillow, happy painting. The pillow is such a sweet idea...look at your cute scarf! And I love this painting. 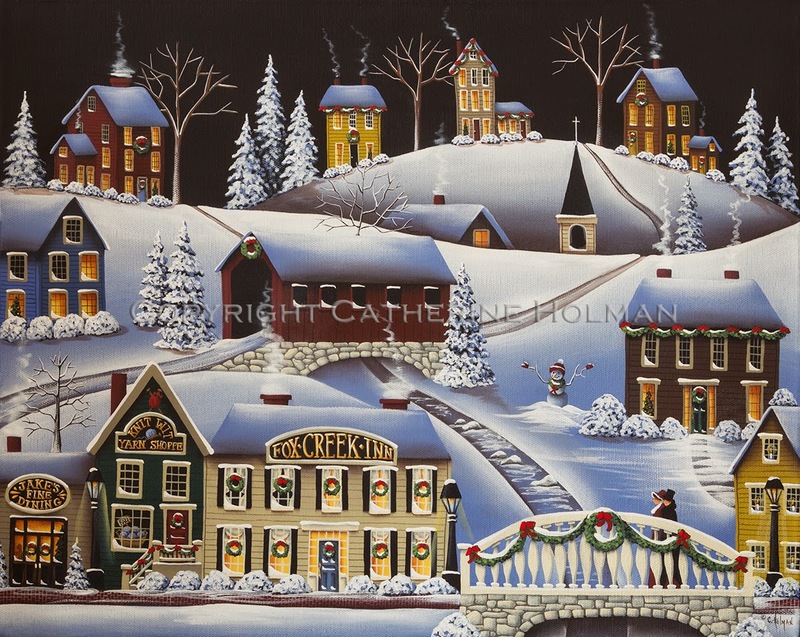 Your Christmas and winter scenes are some of my favs...and I have a 'few' of them, don't I? Enjoy your week! Hugs! I absolutely love this painting. You are very talented. Happy New Year Catherine! Not sure if you remember me.... I still have your little painting of the train in winter that I bought about 7 years ago. Your The Frosting On My Cupcake Sale!